On November 30, 2017, thousands of people joined Boston Mayor Marty Walsh and Nova Scotia Premier Stephen McNeil on the Boston Common for the city's annual Christmas tree lighting ceremony. 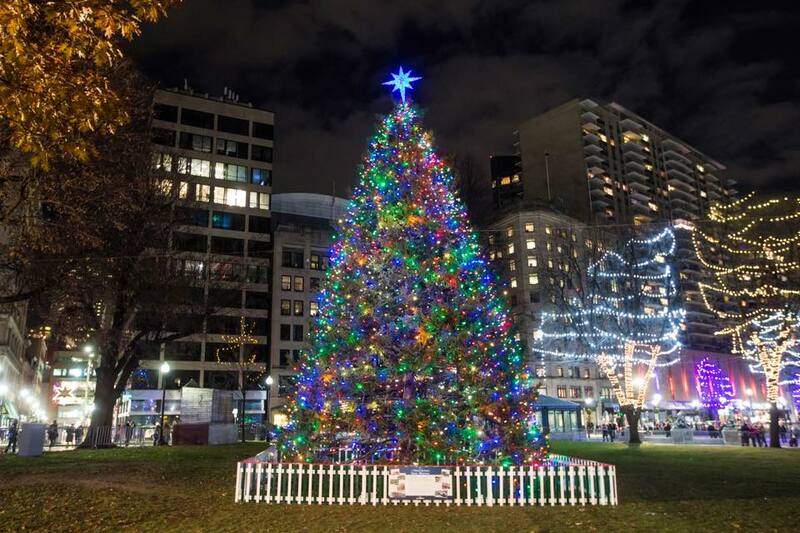 Every year for the past 46 years, Nova Scotia has gifted a Christmas tree to the people of Boston. This year’s tree is a beautiful 53-foot-tall white spruce from the province's Cape Breton Island. This was a special year in that the celebration marked the 100th anniversary of the special relationship between Boston and Nova Scotia. On the morning of December 6th, 1917, the Norwegian SS Imo had an accidental collision with the French SS Mont-Blanc in the Halifax Harbour, causing a fire on the SS Mont-Blanc. The fire was unable to be contained and quickly spread to the ship's cargo; wet and dry picric acid, TNT, and guncotton. The result was the largest man-made explosion prior to the development of nuclear weapons, leveling everything within a half-mile radius. There were an estimated 2,000 deaths and 9,000 non-fatal injuries. When Boston received word of the disaster via telegraph, the city quickly dispatched a train containing food, water, medical supplies, and medical staff to help in the relief effort. Boston’s generosity left an impact on the people of Nova Scotia. Children in the province learn about the explosion in school and are taught about Boston’s role in the relief efforts. In 1971, Nova Scotia gifted a Christmas tree to Boston as a thank you for the city's actions during their time of need. This began the long standing tradition that continues to this day. The lighting of the tree on the Boston Common has itself become a popular holiday tradition, attracting large crowds. The outdoor celebration includes performances, fireworks, and more. This year, folks were rewarded for braving the cold with some delightful performances, that included Buddy the Elf from "Elf: The Musical," the Boston Pops Gospel Choir, Warner Music recording artists Port Cities, former “American Idol” judge Kara DioGuardi, and the Grammy-winning R&B group All-4-One singing holiday classics. The ceremony ended in stunning fashion, when Mayor Walsh, Premier McNeil and Santa Claus lit the gorgeous Nova Scotian tree and with it more than 80 trees throughout the Boston Common.